The Rittenhouse Sheraton, designed by Norman Bel Geddes, became one of the most successful post-war long bell door chimes. 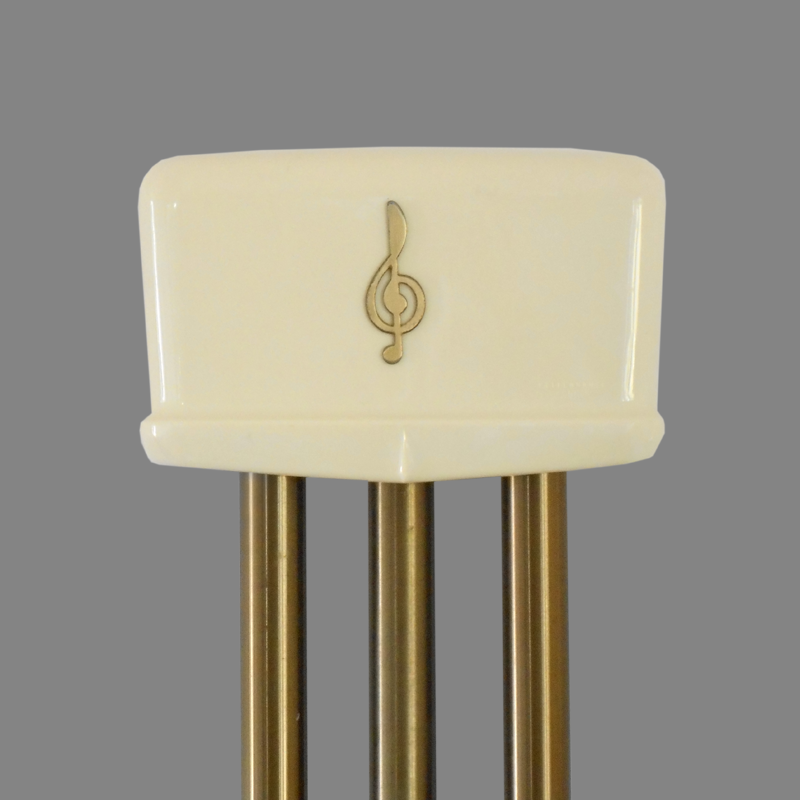 The basic chime design was marketed first as the Sheraton and later as the Lyric III. 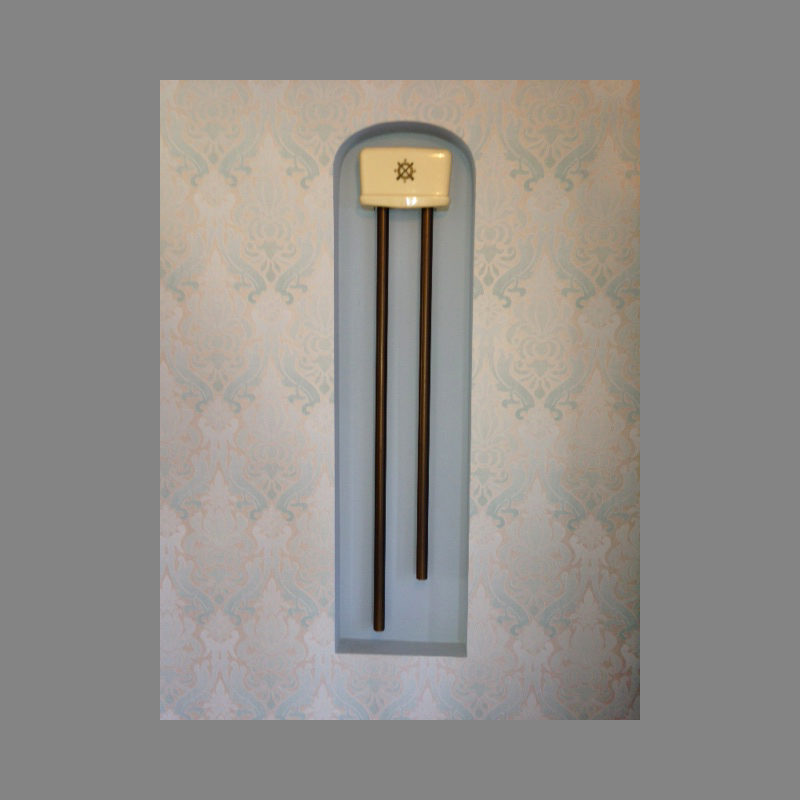 The two models were differentiated by the medallion and the number of tubular chimes. As specified in the 1943 design contract, the Norman Bel Geddes name was leveraged for marketing purposes. 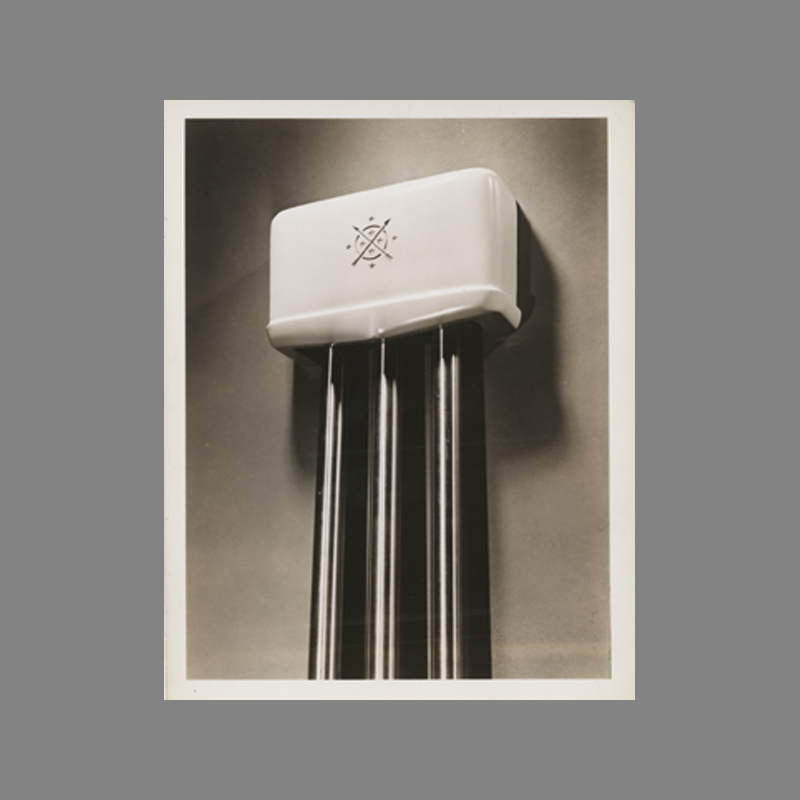 In fact, the Rittenhouse Company had secured an agreement to put the Norman Bel Geddes name directly on the chime as they had done with Russell Wright’s earlier designs. It is unclear why this never happened. I would like to see a design worked out using a transparent plastic with the ornamentation in shallow relief on the inside of the housing so that it could be wiped in with gold and the the entire housing sprayed on the inside with ivory finish. The general effect that I would like to see would not be unlike that which we often find in certain type of etched glassware. By using this method, it should be possible to work out some very delicate, chaste ornamentation which I think would be very attractive. 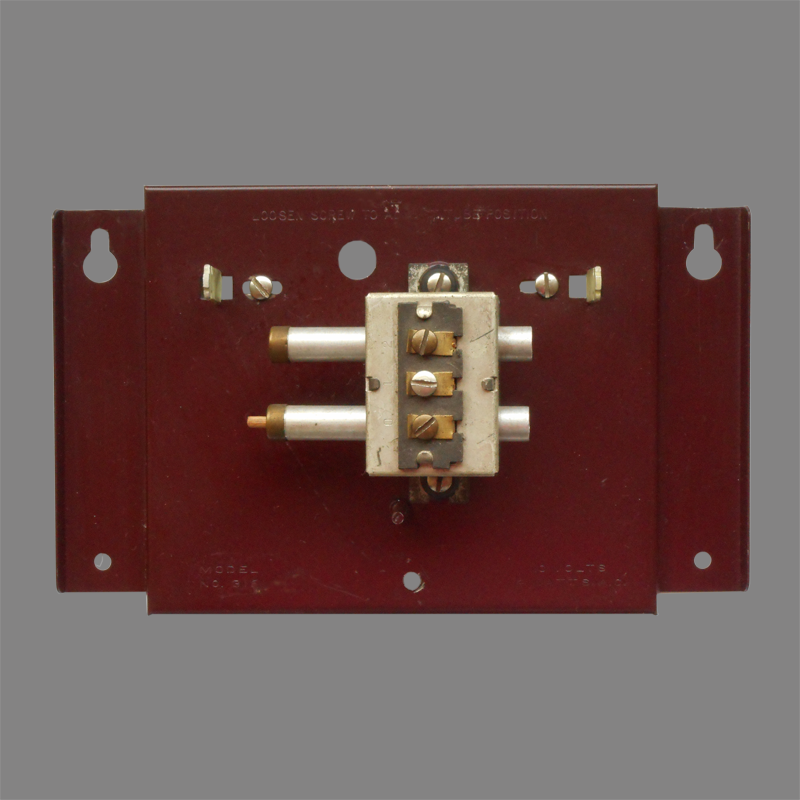 I question if there is enough to be gained by utilizing the transparent plastic technique to warrant the increased cost of manufacture which this method would require. As you probably know, to spray a finish on cellulose acetate or cellulose butyrate requires a very special and very costly lacquer which at best is not too successful. Of course, all this is avoided where the color is in the plastic material and the gold is wiped in on the outside. My only reason for suggesting this technique was because I though it was the only method that could satisfactorily be used to obtain the desired effect on types of ornamentation that require delicate modeling as would be the case in the use of figures, animals, etc. As contrasted with this, where the ornamentation consists merely of a series of lines (that are) essentially two dimensional rather than three dimensional, there seems little to be gained by the use of this more costly process. 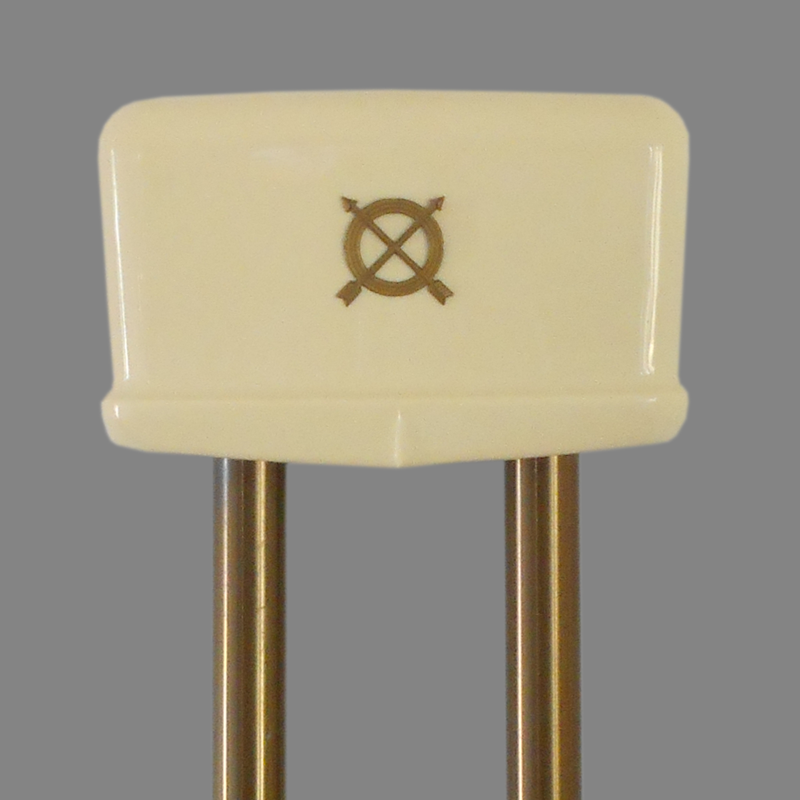 Upon introduction in 1946, the Model 318 Sheraton sported the original Bel Geddes ornamentation consisting of a pair of crossed arrows over a circular design with points interspersed between the arrows This was later simplified with the removal of the points. Although originally rendered with a decorative third bell, the Sheraton was introduced as an two-bell model, most likely to meet a price point. In 1949, the Lyric III, with the decorative third bell and a polished brass treble clef ornament, succeeded the Sheraton while retaining the 318 catalog number. The crossed-arrow motif was reused on a number of other Rittenhouse door chimes. Both the Sheraton and Lyric used the: “Rittenhouse Floating Percussion mechanism” which insures quiet, long-life operation”.